The talk will take the intense conflicts surrounding borders in many parts of the work as a point of departure. Consistently with the approach deployed in the book Prof. Mezzadra wrote with Brett Neilson (Border as Method, or, the Multiplication of Labor, 2013) it will then ask whether it is possible to take the border not merely as an object of investigation but also as an epistemic viewpoint on the tensions ad transformations crisscrossing the global processes that shape the world we live in. The talk will then unpack the notion of border and will focus on its political, economic, social, cultural, linguistic and even epistemic components and will consider them from the angle of the production of subjectivity. 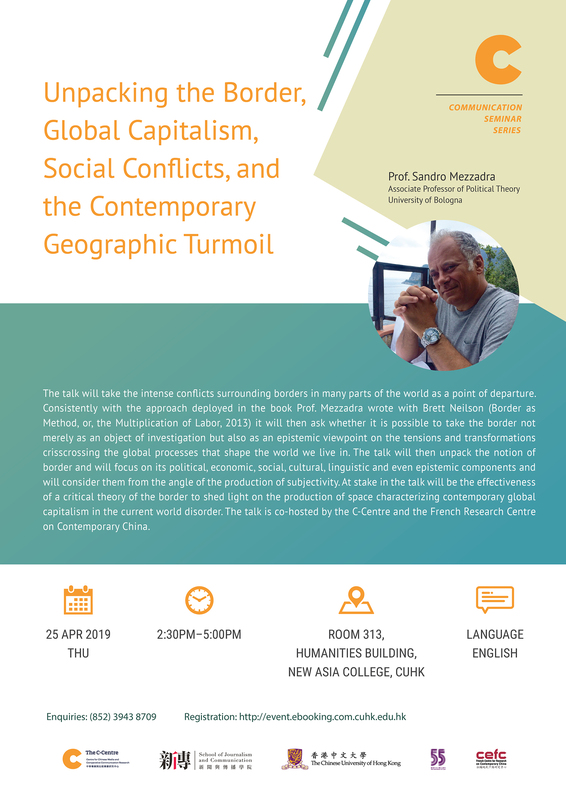 At stake in the talk will be the effectiveness of a critical theory of the border to shed light on the production of space characterizing contemporary global capitalism in the current world disorder. The talk is co-hosted by the C-Centre and the French Research Centre on Contemporary China.